and how she is creating her work in the world around this. I wanted to 'hear' more. She has spent a lifetime exploring this connection. and soul to search for balance and heal itself and this is what I practice. 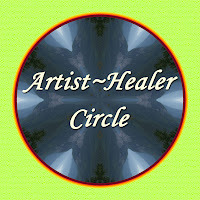 Have you always identiﬁed yourself as both an Artist & Healer? mind, if I was depressed or deeply troubled about something. life, I just needed to be patient about this. decide to leave it alone in that moment until we are ready. Do you think all Artists are Healers or all Healers are Artists? have to want to be there and be willing to do their own work. I also believe that everyone has the potential to create, it is part of the human condition. that not all of us are willing to surrender to, nor want. How does your healing work inform you, or offer you unique perspective, as an Artist? fascinating method to understanding who we are and what we need. presentation and as part of a card deck that is used in reference to archetypal images. them, suddenly something new reveals itself that was not visible earlier. process of actually seeing deeper within themselves. the viewer in revealing some impression of how they have interpreted an experience. created with certain images used throughout. Has anyone had major inﬂuence or impact on your journey of discovery as an Artist-Healer? playing a role in your own personal story. have had and work it into how I present to the people I may be working with. Moore, Carolyn Myss and really the list goes on. Koff-Chapin, The Painting Experience, Point Zero Painting, and Soul Collage. Where can Readers ﬁnd out more about you or connect with you? Here you will be able to see my art and a sampling of the images from the card deck project that I talked about. 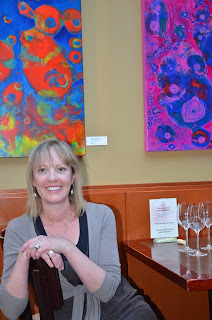 You will also be able to see News and upcoming events, as well as a place to contact me. my studio and some of my projects that I’m working on.